This bright vintage quilt features the traditional favorite Dresden Plate pattern and is finished with an Ice Cream Cone border. It is unused and never washed. BACK & BINDING : Cotton back. CONDITION : This has several faint spots as it hasn't been washed. Circa 1945 (based on fabric types). 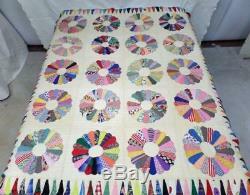 SIZE : This measures 65" X 78". (The top of a twin size bed is 39"x75", a full is 54"x75", and a queen is 60"x80"). The items we sell are previously owned and we endeavor to describe them and photograph them as accurately as possible. Doing that is against U. 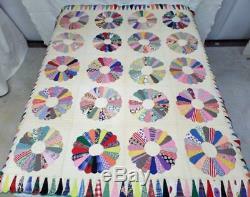 The item "NEVER USED Vintage Handmade Dresden Plate Quilt c1945 #8006 Bright Colorful" is in sale since Wednesday, December 12, 2018. 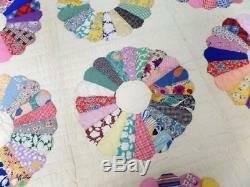 This item is in the category "Collectibles\Linens & Textiles (1930-Now)\Quilts". 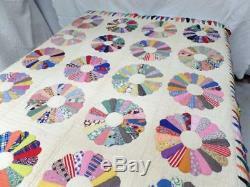 The seller is "quiltsnmoresa" and is located in San Antonio, Texas.